NCC8: Society for Pennsylvania Archaeology: Happy Birthday, Jim! 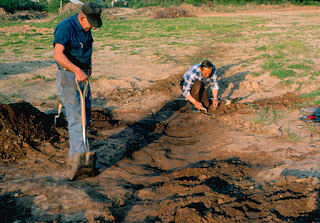 Jim Bressler, left, at Bull Run excavation. James Bressler hasn't been keeping regular office hours this summer. Usually, the octogenarian spends Tuesday and Thursday mornings at the Lycoming County Historical Society, tucked in a corner of the museum basement. There, surrounded by tall metal cabinets filled with stones, bones and pottery fragments, Bressler continues his life-long quest to understand how prehistoric Indians lived along the West Branch of the Susquehanna. Bressler has been spending most of his free time "in the field" instead of the museum's basement and he's happier for it. A self-taught archaeologist, for nearly five decades Bressler has been studying Indian technology, or at least what remains of it after hundreds, even thousands of years buried in the soil. His dedication and interest resulted in the formation of the local Chapter 8 of the Pennsylvania Society for Archaeology in 1956 and the excavation of numerous important Native American sites in the area. Those were, he reflected, glory days and as the last living charter member, he tries to maintain the present-day chapter's interest in archaeology. Every Tuesday evening, Bressler comes to the chapter's summer dig and expounds while he excavates. "My old buddies are all gone; they're probably watching from some cloud up there," he said, gazing at the sky. "Oh boy, we had enthusiasm; we had real momentum." Undeterred by aches and pains that remind him of his age, Bressler continues to lead the chapter's summer digs and on Friday, Aug. 13, he turns 90 years old. He plans to spend the morning on his knees in the hot sun scraping the hard, brown soil at the Snyder Site with his trusty trowel. Bressler and the chapter opened the site in May, and were briefly joined by Lycoming College students taking a field archaeology course. The chapter is still looking for volunteers to help with the dog days of summer. The site is located in a field owned by Richard Snyder, a local farmer and owner of a topsoil removal company. Snyder occasionally finds artifacts in his soy and cornfields, and invites the chapter to investigate. It's not unusual to see people wandering through Snyder's newly plowed fields, heads bent as they concentrate on finding bits of Indian pottery and arrowheads. Snyder doesn't mind if he knows the visitors, but he tries to discourage trespassers. Not only are they uninvited, but they are destroying the cultural heritage left behind by Native Americans. The Snyder Site, however, is only one small part of Bressler's legacy. A former educator and driving force behind the creation of the Williamsport Technical Institute, (former Williamsport Community College and now Pennsylvania College of Technology), Bressler's life has been dedicated to knowledge. 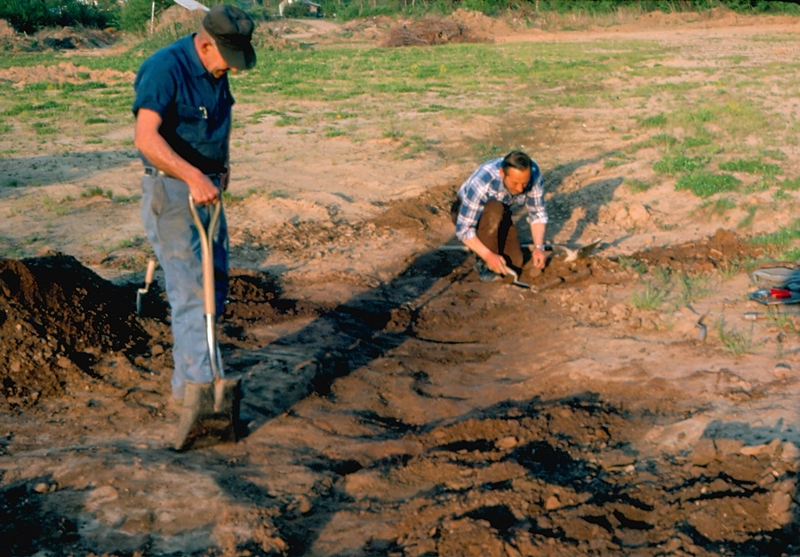 His archaeological and his historic investigations in the area have been well documented. Excavating Indian sites means that Bressler has a responsibility to publish his findings. This he has done in a series of paperback books, along with help from several Chapter 8 volunteers. His work has added immensely to the area's knowledge of Native American culture as far back as 5000 B.P. (Before Present). Another legacy is the James P. Bressler Heritage Trail, a walking track that is as invigorating as it is educational. This tranquil spot is part of Loyalsock Township's Riverfront Park. Located on Canfield Island it overlooks the Susquehanna River's West Branch and the trail is lined with signs that tell of the area's prehistory and history. "That is, in my estimation, one of the best-kept secrets in the county," Bressler said of the trail when it opened. "This is a unique attempt to integrate a number of different things. First of all, local history is really not being taught in our schools because there are too many competing things to teach. I understand that. But this is a unique way to combine a pleasant walk, a history lesson and nature study. It's just a pleasure to walk around there. "The story of how it (the trail) came about is interesting," he said, chuckling. "Some years ago, about the middle '90s when we were working on the Ault Site, call it inspiration if you like, I thought it would be a good idea to put together a synopsis of the events that have occurred in the area of Canfield Island. I call it the 'Loyalsock Historic Complex; A Rationale for commemoration.' It's a synopsis of many things, historic and prehistoric. "It gives you a background of the area, of its importance in the scheme of things. In archaeology, it's up to the local people to safeguard and enhance their own concepts of what's important," he added. It is a tribute to Bressler that the township acknowledged his historic contributions and the significance of his archaeological research. And Bressler relished the gesture. Loyalsock Township recognized, 'Yes, indeed. Here's an opportunity to put up a park with river frontage, a beautiful spot.'" It is primarily because of Bressler's research that Canfield Island was named to National Register. His research and excavations were, Bressler said, "The Alpha; the trail is the Omega. It's all a part of what we call heritage. This is what everybody inherits." The James P. Bressler Heritage Trail is open to the public, located just off the Broad Street, Montoursville, Exit of I-180, near Williamsport. Birthday cards for Bressler can be sent to: James Bressler, Lycoming County Historical Society, 858 W. Fourth St., Williamsport, PA 17701. More information is available by calling 326-3326.